Spacious 2 bed, 2 1/2 bath self catering holiday rental close to Rockley Golf Course and the popular Rockley beach. Less than 10 minutes drive to Bridgetown in one direction and the night-life hub of the island - St Lawrence Gap - in the other. The fully air-conditioned property is on a small development in a quiet residential area and has a lovely shared outdoor pool. The property is strictly non-smoking and this includes all outside and communal areas on the development. It is recommended that people who do smoke look for a property elsewhere on the island. Generous discounts available for those seeking a longer term rental. Tim and Hilary Warren have been married for over 30 years and live in Dorset, England. They have four grown up daughters, stage the Chesil Rocks music festival each year which raises funds for Samaritans of Dorset, and enjoy going off in their VW camper van! Tim and Hilary visited Barbados in 2003 - where Tim's mother had grown up - and fell in love with its beauty, culture and people and decided to buy a home on the island. They chose Springcourt as it was a lovely new development a mile inland, off the tourist track and in a quiet cul-de-sac - but still just a few minutes away from a great beach, shops, restaurants and other amenities. Springcourt is a modestly sized and most attractive condominium development of around 15 houses and apartments, set in beautiful gardens and with a lovely shared pool. The property itself benefits from one large living area downstairs and two generously sized bedroom upstairs both with their own bathrooms. High quality bathroom with sink inset into granite and fitted with a large illuminated mirror. The second en suite is spacious and airy and benefits from a large walk in shower and is also fitted with a large mirror. This is a very spacious villa furnished to a high standard. It is in a good/quiet/safe location only a 20min walk from the beach and main shops in Rockley. The pool is lovely and massive for a villa. We had a few minor issues which were dealt with brilliantly by Dawn the agent, who is the most helpful person on the island!! My trip was in March 2016 not 2018 so firstly a big apology to the owners Tim and Hilary for taking so long to write this review! We were met at the property by Ronald who was lovely and took time to show us around and answer any questions we had. He also called during the stay periodically to check we were ok and gave us his number if we needed anything. Thank you Ronald. The purpose of my trip was two-fold, celebrate my sister's 50th birthday as well as a surprise for my father (who was 82 at the time). The house is just how it was in the photos. Very homely and comfortable with all mod cons you would want/need. Had the pool to ourselves most of the time we were there. Was very quiet, felt very sasfe, lovely neighbours- a mixture of locals and others on holiday. Would recommend a car just because of the distance to the main road. It wasn't that it was far (less than 5 mins drive) but that the road to the villa goes around the edge of the golf course so a bit long for my dad to walk everyday. Locals told me there was a short cut, if walking, but I didn't find it -too busy enjoying Barbados. However once you were on the main road Rockley beach /shops/food are all there. I even found a little local Jamaican vegetarian takeaway near the villa that was amazing. I've been travelling to Barbados for more than 15 years and always have a wonderful time and this was no different. Would definately recommend this villa and would return. Thanks Tim and Hillary for sharing your lovely home. Great location nice peaceful neighbour hood but 5 mins from everthing you need beaches , restarants etc. We stayed here for 13 nights, we are a family of four so the space was perfect for us! Renting a car is a must, I would not enjoy that walk to the grocery store or to the beach in the heat but it is doable if you are not interested in driving. Pool is quiet and we had it to ourselves most of the time. Condo complex was clean and well looked after. We would have loved to have had use of a BBQ during our stay but other than that it was great. I found this rental property online. After corresponding with the owner, Tim, and sending a friend in Barbados to check it out, I decided to book 12 days, for myself, my girlfriend and my mother. Despite not knowing the exact location beforehand, we were all happy upon arrival. The property was exactly as shown online. In fact it was larger than we expected. The property was very clean and well stocked with cookware, dishes, cutlery, and linens. It was also great having a local phone, a flat screen TV with satellite, a nice stereo system, and of course, wifi. As stated by others, it's a 20min walk from busy Rockley Beach, some days we wished it was a bit closer, but a cheap cab ride can always fix that. Dealing with the owner Tim was a complete joy. He was always quick to respond and even went to the trouble of mailing info and a map from England to my home in Canada, before we left! Dealing with his agent in Barbados, Brian, was also easy and awesome. I would definitely recommend this place to family and friends looking for a place to stay in Barbados. I stayed at 3 Spring Court in January 14 for 2.5 weeks with both my Mum and my Son aged 2 ½. We had an absolutely amazing holiday. We are regulars to Barbados and would highly recommend this accommodation having stayed at many places on the South coast. It’s a real home from home and ideal for the independent traveler. Near to everything you need but far enough away down a very quiet residential road to be very peaceful. The local Rockley area has plentiful shops, supermarkets bars and restaurants. 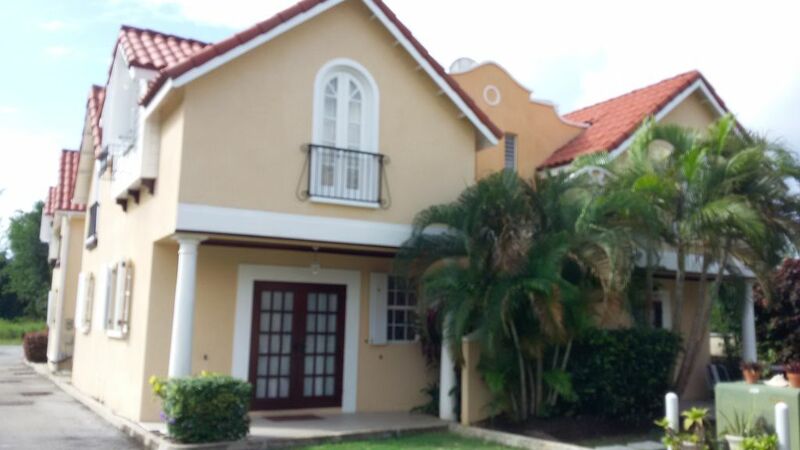 The townhouse itself has everything you need for a comfortable stay (beds comfy, lots of towels, linen etc) and the local property managers; Brian and his wife Luana are there to assist with anything you need when on the island. The property is spacious, clean and modern – A/C when needed works really well but the ceiling fans do the trick most of the time. Dishwasher was a treat for us. The pool area is lovely, very quiet, almost as though it’s just for you (and the local Monkeys that parade through every day!). You are only a few minute’s drive down to the beach or a 15/20 minute walk. We had a car for part of our stay as I like to do a lot of exploring (and which I would recommend with young children or for the less energetic) however the walk to the beach (20 mins) or to the local bus (10 mins) is totally do-able – it just takes a little longer with a 2 year old stopping to examine every tree/house!! As an alternative taxi’s are also relatively inexpensive – in future we will find a local driver and negotiate for him/her to be on the end of the phone to help during our stay then enjoy the best of both worlds – walking/busing or taking a taxi when needed as this is cheaper than car rental. Highly recommend this place – we will be back! The property is situated in a quiet residential area and is just one mile from the very popular Rockley (Accra) Beach. It is adjacent to Rockley Golf Club and less than 10 minutes drive to the capital Bridgetown in one direction and the nightlife hub of the island - St Lawrence Gap - in the other. There are a couple of good supermarkets 5 minutes drive away and the Sheraton Centre shopping Mall is less than 10 minutes away. There are a wide choice of excellent and reasonably priced restaurants within 5 - 10 minutes drive. The West coast can be reached in 15 minutes.